Here in America, we are very spoiled. Much of what we have we don't even appreciate and it isn't until something we use everyday is gone that we realize just how we truly are blessed. Many years ago, I went on a missions trip to the Dominican Republic and it really opened my eyes to how desolate and desperate many people's lives are. Bathrooms that were simply holes in the ground surrounded by sheet metal for privacy, dirty and disheveled children running barefoot through dirt streets, small houses packed full of families who lived together because they could not afford their own housing and so much more. It was heartbreaking. Well, if you have a generous heart this Holiday season, why not give a gift that will mean more than anything a child has ever received? 1. Find a charity with a track record; review the organization’s IRS tax status, check how it spends money and makes important decisions. Good places to find this information are Charity Navigator and GuideStart. 2. Be thoughtful about an organization’s overhead and administrative costs; cost efficiency is an important factor when choosing a charity, but effectiveness is the key. 3. Ask questions before you give – visit a charity’s website, send an email, or call if you have concerns. 4. See what others are saying about the charity of your choice via social media and trusted online forums. 5. Watch for scams; be on your guard for emails that ask for credit card or other personal information. Check the Better Business Bureau Charity Reviews website ( www.bbb.org/charity-reviews) before giving. I have to admit that I am always skeptical when it comes to giving money to charities and therefore, I rarely do unless I know them extremely well. World Vision is a reputable, non-profit organization with a wonderful track record of fighting poverty and aiding women, children and families all over the world. I love it when a company takes the well-being of those less fortunate into consideration and actually does something to help them. When it comes to shopping for holiday gifts, you can do something very unique through World Vision to help others. World Vision offers 36 hand crafted items that you can purchase for someone and at the same time, help someone in need! You can also give money for livestock, clean water, wells and other things. 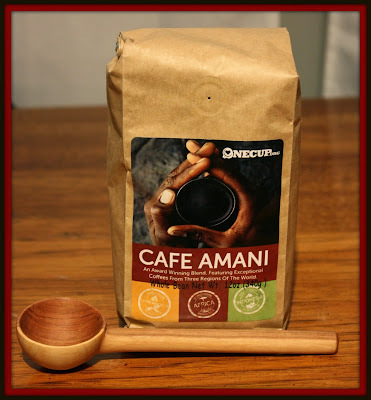 For this review I was sent one of the hand crafted items available in the World Vision Gift Catalog and I chose to receive the Fair-Trade Coffee Set. 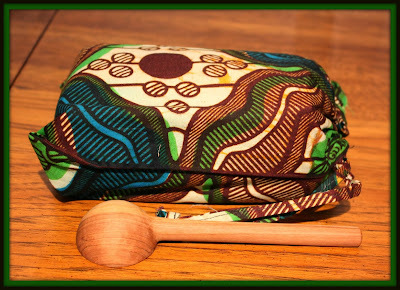 This set comes in a beautiful, African sewn gift bag, hand sewn by local women. I love the colors of this bag! 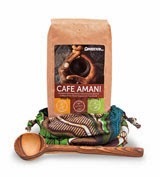 You also receive a gorgeous, hand carved olivewood scoop for the coffee. This set is just one of 36 different gifts that you can purchase to help another child or family out this holiday season. 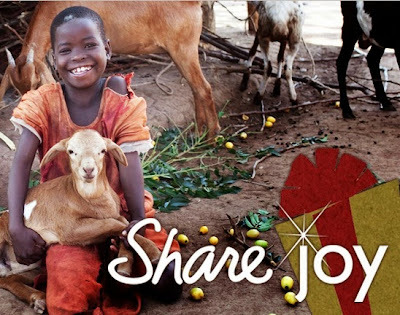 I would strongly encourage you to check out World Vision's Gift Catalog to see what you can do to make this the best Christmas ever for someone across the world. Disclaimer: I received no monetary compensation for this post. I did receive free products in exchange for this post. All quotes and stock photos are from the World Vision website and email. Prize is being provided and shipped by the sponsor. This blog is not responsible for lost, stolen or damaged prizes. All thoughts and opinions are 100% mine. I would give a Foot-Powered Water Pump$200 if I could. I would give a goat and two chickens. I would give the goat and chickens. Super cute! I would give a share of the deep well. I'd like to give $250 Worth of Necessities in the USA$25. I would give a goat and 2 chickens. I would give Hope for sexually exploited women and girls! I would give the goat and chickens.. I would give education for a child. Being a long distance back packer, I know the importance of clean drinking water...so that would be my gift. I would give a goat and 2 chickens if I could! I would give a share of a deep well. If I could afford it, I'd love to give them a fresh-water well. I would give hope for sexually exploited women and girls.